← Just Slide Through Life? Since the weekend was sunny for a change, we spent most of the two days outside. After church we came home and ate a quick lunch. After we did some gun siting (well Danny did, lol) we went to Iron Mountain marina and enjoyed spending a gift certificate that I had. We had forgotten all about that certificate, which was given to me spring of last year as I won a tshirt design contest they put on. What a blessing for the New year! It reminded me that we should never forget the good gifts God gives us. We need to be lavish in our spending of those gifts. Although I used up that certificate Sunday, God’s gifts can never be used up. They keep on giving and we keep on using them to build ourselves up in our most holy faith. And we even can pour them out on others for the benefit of blessings from the Lord through us. Oh beloved, when you have nothing in your hands you can be assured that you have riches untold. Gifts of faith, love and light are yours always. God wants you to know that you are never a pauper for He doesn’t measure you by your stock portfolio or your bank account. He measures the heart and He measures that with the Blood of Christ. Your certificate of value was signed at the Cross and validated at the Resurrection. He knows you well, but He sees you as a beloved believer – full of the promises He has poured out on you. Maybe things haven’t gone well for you lately, but that doesn’t mean God is angry with you or indifferent to your needs. He doesn’t pour out His wrath on the believer – He teaches and woos and corrects – all in love. You don’t have to worry if you will have enough faith – it’s built within your born again DNA. You don’t have to worry if He will help you – He is the God of all Help. It’s His nature to be your advocate, your provider and your guard. It’s time to expose the lies of the enemy and walk out of that prison of despair. You were meant for more than just barely scraping by. You were meant to love and be loved, to rejoice and be full of joy and to live for Jesus in the power of His resurrection! God loves you and He’s for you. Run to Him this morning and ask Him about the gifts He has for you. Thank Him that they never run out. Thank Him that His fellowship is your finest gift and His Spirit is your reason for walking the earth today. 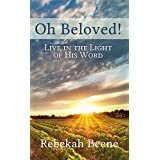 And live, beloved, in the Light of His Wonderful Love! Romans 5:15 But there is a great difference between Adam’s sin and God’s gracious gift. For the sin of this one man, Adam, brought death to many. But even greater is God’s wonderful grace and his gift of forgiveness to many through this other man, Jesus Christ. Romans 8:32 He who did not spare His own Son but gave Him up for us all, how will He not also, along with Him, freely give us all things? 2 Peter 1:3 By His divine power, God has given us everything we need for living a godly life. We have received all of this by coming to know Him, the one who called us to Himself by means of His marvelous glory and excellence.